IF THE SHOE FITS, REPAIR IT AT JERRY’S LEATHER SHOP & SHOE REPAIR! Jerry’s Leather Shop and Shoe Hospital started business in May of 1983 in downtown Marion. The business products and services are many and include cleaning and restoration of leather and suede, boot and shoe repair (new soles and heels), shoe dyeing and/or stretching, repair or replace zippers, replace eyelets or speed hooks, as well as dry cleaning drop-off and pick-up. Jerry’s Leather Shop and Shoe Hospital also carry a full line of orthotics for your feet, and they can custom build lifts for your shoes (with a doctor’s prescription)!! What I love about Jerry’s Leather Shop and Shoe Hospital is that they have successfully proven it is cheaper to repair with quality workmanship than to buy new, and it is always top notch work! When given the opportunity to speak with Bruce, I jumped! I asked Bruce to tell us more about the trade, and he first acknowledges “Every shoe is different.” There are three basic soles for shoes – leather, rubber, and crepe. Each sole was created for different purposes for example, leather is best for dancers and rubber for construction workers. For women that love to wear heels, have those awesome heel pads fixed! The biggest reason that women throw their shoes out is because the screw is sticking out of the heel. For as little as $10.50 per pair, you can save those awesome shoes! Therefore, those six pairs of shoes you can have re-heeled will cost about as much as a single pair of new shoes! There are different methods for repairing a shoe, and there are things you shouldn’t do when repairing shoes such as, use glue on leather unless it is glue designed for leather. Other glues can damage the leather and make repairs very difficult or impossible. If you are wanting to take preventative measures to protect those fancy new shoes, don’t guess! When it comes to extending the life of your shoes, you can talk to our resident shoe repairperson and receive information on preventive care to extend the life of your favorite shoes! Like all artists, Bruce is known by most of his clients for his signature mark, which is the little heart he adds to the shoes he repairs, when needed or requested. The first shoe to receive this signature mark was a nurse’s shoe that was simply in need of a patch. She liked it the heart patch so much, she came back to have one placed on the other shoe! The strangest repair or transformation Bruce has done was create a dog carrier out of purse! That’s right! Did you buy an item you wish was something else? Maybe Bruce can help?! 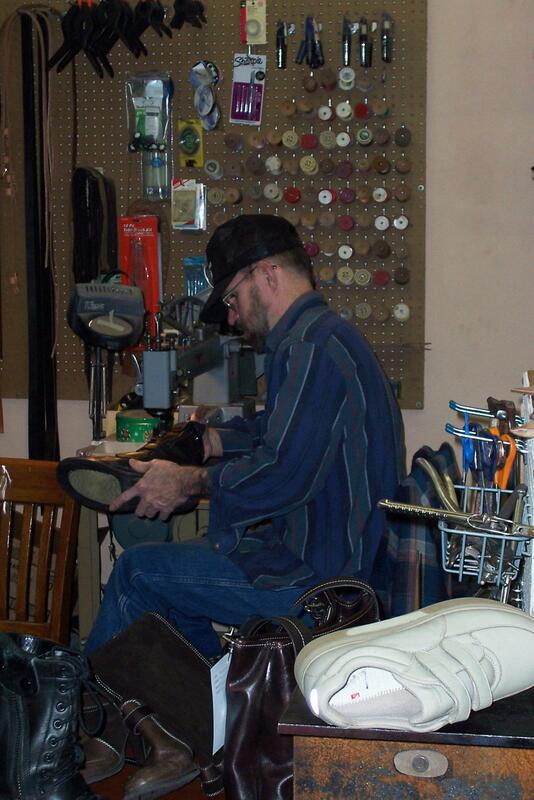 Though shoe repair and leather working is their specialty, there is so much more at Jerry’s Leather Shop & Shoe Repair. I was thankful to hear Bruce has no plans or thoughts for retirement yet; however, while casually conversing with Bruce I get the impression that gardening, movies, and books will be a big part of the retirement plans when that faraway time comes. Bruce has memories of visiting the Indiana Theatre two to three times a week. He now frequents the AMC Marion. A huge movie buff, Bruce has over 1000 DVD’s in his collection! Bruce also has two acres of mostly vegetables that he tends too every day. Bruce enjoys reading books in print by authors Asimov, Louis L’amour, and Edgar Rice Burroughs, and it just so happens there is a book cart by the entrance with a small selection of neat books for $1. This initiative was started by the wife of owner, Barry. For more information, visit their web site at http://www.jerrysleathershop.com and LIKE them on Facebook @ Jerry’s Leather Shop & Shoe Hospital. Previous WELCOME TO MOE’S!! ANOTHER AWESOME THURSDAY PICNIC PLANNED IN THE COURTYARD! Next FOLKS LOVE FOLKIE’S IN THE 3RD STREET COURTYARD!